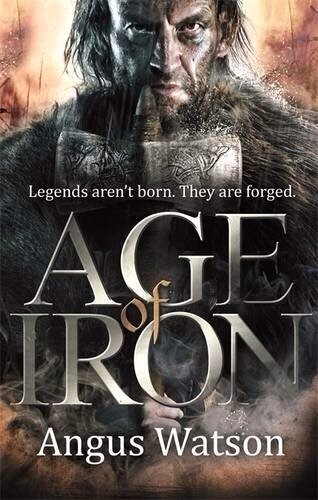 Angus Watson was kind enough to take some time and answer a few questions about his debut, Age of Iron, the idea of ‘grimdark’ and British sense of humour. For those yet to read Age of Iron, could you give a brief outline of the novel? The trilogy rewrites how the ancient Britons defeated Roman general Julius Caesars’ unstoppable legions and his druid’s dark magic (which actually happened, possibly without the dark magic bit). In book one, a skilled but lazy warrior, a beautiful, revengeful archer, a weird mystical child and others unite to defeat the evil forces of southern Britain’s tyrant king. I’ve heard that the novel was born from a newspaper article you wrote, could you explain how your debut came about? I wrote an article on Iron Age hillforts for the Telegraph. There are loads of these gigantic forts – ditches and ramparts dug around the flattened top of a hill – all over southern Britain. The Iron Age was a busy, massive, but totally unknown part of British history despite being relatively recent (Age of Iron is set just over 2000 years ago. Egypt’s pyramids that still sit next to KFC in Cairo are 4500 years old). Walking on a hillfort with an expert called Peter Woodward, I asked him if the British Iron Age was like Conan the Barbarian, full of muscle-bound warriors rescuing virgins from snake temples. He said that as far as we know, yes. I decided to write a novel set in the period there and then. Whilst there are obvious differences, how did your journalism background feed into your novel writing? Economy. My hillforts article for the Telegraph, for example, was 800 words long but I could have written 30,000. I learnt to cram everything I wanted to say into fewer words without it feeling crammed. At least that was the idea. The Age of Iron trilogy is about the same length as famously long War and Peace, so some might disagree. The Iron Age is an intriguing setting for a novel – how much research was involved and what was it like to infer and extrapolate from the little available history to create your background? Because the ancient British didn’t write and any oral histories have since disappeared, there is very little research that can be done. So I read all the available books, went to three museums, climbed a load of hillforts and that was that. Then I very much enjoyed building a world within the parameters of known history. I’ve described Age of Iron as ‘grimdark’ what are your thoughts on this type of classification? The book is grim and dark in parts but I don’t think that is the overall feel, considering that the real centrepiece, possibly, is the platonic relationship between a jaded man and an enthusiastic child. However I realise that books need to be categorised, and if Age of Iron is being put into the same category as Joe Abercrombie’s excellent novels (which aren’t that grim or dark either) then I’m very happy. However, your novel (and many of the characters) displays a fantastic sense of humour – what were the roots behind that? I think there’s an amazing prejudice against people in the past. We see them as one dimensional and stupid and I think that’s utterly wrong – they were as passionate, clumsy, manipulative etc etc as we are. So, if you go into any office or factory or school or army barracks or wherever today, you’ll find witty people making funny jokes. I think it was the same in the past, so that’s why many of the characters have senses of humour. As to the book itself having a sense of humour, I think you can either cry or laugh at the world and I choose the latter. There is some great scepticism and discussion around religion and the Druids – could you unpack your thoughts on why your characters have such reactions in what was, seemingly, a religious age? See previous answer. People in the past were the same as us. Today we have a new religion called climate change. Some believe fervently and will scream hatred if anyone says a word against it, some defend it passionately but still drive Range Rovers, politicians and business exploit it to make political capital and money, and some people, while not necessarily denying that climate change exists, observe the others’ behaviour and mock it. Christianity got the same treatment when it was big, as did the Roman gods, so think it’s safe to say that the Iron Age gods provoked the same reactions. I was also intrigued by the very modern attitudes of the British women and your strong female leads – would a Lowa have existed back then? I’ve got a half-baked, badly-researched idea the Romans subjugated women through their own culture, then by changing Christianity into the form that’s been passed down. Before the Romans conquered Europe and the Roman version of Christianity conquered the world, women were seen as equal to men. It’s a theory, it would probably fall apart if someone who knew what they were talking about debated it with me, but I like it and I believe it. The theory is slightly backed up by the most famous British rebel against the Romans – Boadicea – being a woman. The mix of historical fact and fantasy was inspired and your magic system was fittingly subtle – what was the thinking behind the magic and those who wield it? I like the idea that there was a bit of magic around at the time. Plenty of people believe that Jesus could do a few tricks less than a hundred years after the events in my books and I don’t think Spring, Drustan’s or Felix’s magic is any weirder than his. There’ll be more about what that magic is and why it’s gone in the next two books. Dug and Spring are wonderful characters with a funny and touching relationship – can we expect to see more of them? There will be more of both of them, but they’re going to face challenges that make the Monster look like a baby rabbit (there were no rabbits in Britain during the Iron Age, so they won’t face any actual rabbits until one of them goes to Gaul (France) in book three).